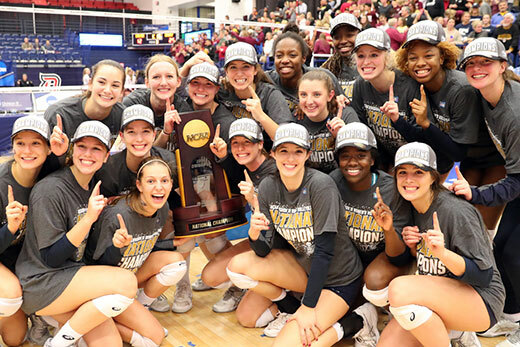 Emory’s volleyball team won its second-ever national championship on Saturday, Nov. 17, beating No. 1-ranked Calvin College in straight sets. The win marks the university’s 25th NCAA Division III championship. The Emory University volleyball team won the program's second-ever national title Nov. 17, defeating No. 1-ranked Calvin College in the NCAA Division III championship match. The Eagles recorded a 3-0 decision (25-22, 25-16, 25-12) over the Knights, closing the season with an overall record of 30-6. Emory's win total represents the 12th straight campaign of 30 or more wins for the program. The previous Emory volleyball national title came in 2008. Senior Karissa Dzurik led the Emory attack with 13 kills, her 23rd double-figure effort of the year, and posted a hitting mark of .310 (13-4—29), while sophomore Leah Saunders and first-year student Tara Martin each contributed eight kills with the latter hitting .467 (8-1—15), her seventh match this season of .400 or better. Senior Sydney Leimbach chalked up seven terminations, hit .545 (7-1—11) and added a team-high six total blocks. Senior setter Mady Arles, who was named the Most Outstanding Player of the Championships, dished out 35 assists while adding five kills, a team-high three service aces and five digs. Junior libero Elyse Thompson spearheaded a solid defensive effort by the Eagles, leading all performers with a season-high 24 digs. Arles, Saunders and Thompson were named to the Championships All-Tournament Team. Emory dominated in all facets of the match, hitting .364 (46-10—99), its third outing of .300 in its six NCAA matches, compared to the Knights' .125 (29-15—112). The Eagles held a 58-40 advantage in digs and finished with a 9-4 edge in total blocks. The first set saw Emory hold a 7-4 lead after back-to-back aces by Arles, but Calvin responded with a 4-0 run to go ahead by one point. Trailing by a 16-15 margin, the Eagles used a kill by Dzurik, an Arles ace and block assists by Saunders and sophomore Finn Wilkins, to claim an 18-16 lead. Up by a 19-18 count, Emory put some distance from the Knights with a 4-1 spurt that saw Saunders record two kills and an ace, while Martin came through with a successful attack attempt, to push to a 23-19 lead. Calvin moved to within two points at 24-22 before a Leimbach kill gave Emory a 1-0 match lead. The Eagles began to take control of the match early in the second set, snapping a 5-5 tie with a 7-2 run, with Martin dialing up a pair of kills in that run, to post a 12-7 lead. Emory maintained a five-point advantage before scoring four straight points that enabled it to claim a 21-13 cushion. An attacking error by the Knights put the Eagles one point shy of taking a 2-0 lead in the match, and that was accomplished courtesy of a kill by Wilkins. Emory put on a clinic in the third set, hitting .400 (16-2—35) while the Knights could only muster a mark of .023 (7-6—44). Emory led by an 8-6 count before blowing the set wide open with 11 unanswered points with Leimbach doing a fair amount of damage in that blitz with three kills and a block solo while Dzurik also came through with three terminations. The Eagles extended their lead to 14 points at 21-7 following a kill by Wilkins before Calvin came up with three points to reach double figures. A kill by Saunders followed by a Knights attack error put the Eagles one point shy of winning the crown and Arles saw to that with a dump shot that found the mark. Emory University has a broad-based intercollegiate athletic program with over 400 student-athletes comprising the school's 18 varsity sports, a tally that will rise to 19 in 2019-20 with the addition of women's golf. Emory has now won a total of 25 Division III national championships. The women's swimming and diving team leads the way with 11 national titles (2005, 2006 and 2010 through 2018) while the women's tennis team claims seven crowns (1996, 2003 through 2006, 2014, 2016). The Eagles' men's tennis program has captured four national titles (2003, 2006, 2012, 2017), the volleyball team two national championship (2008 and 2018) and the men's swimming and diving program one national crown (2017).